With its graceful rounded curves, Linea has been a must-have icon of elegance and femininity ever since it was created in 1987, and is famous both for its bezel with the prominent engraved numerals and its distinctive system of interchangeable straps. For this holiday season, Swiss watch brand Baume & Mercier offers three magnificent emblematic watches in extremely refined versions that nevertheless stay true to the femininity of the original model. The “sundeck” decorated case backs, the brand’s own discreet “seaside living” signature, can be personalized and engraved to order, making each piece a unique object. Linea 10092 is the jewel of the collection unveiled by Baume & Mercier for the holiday season. A dazzling gift for someone special, the famous combination of case and integrated bracelet in satin-brushed steel is here enhanced by the omnipresence of 151 set diamonds, including 32 on the bezel, 11 on the white mother of- pearl dial, and 108 on the central bracelet links, making a total of 1.96 carats. Ideally proportioned, with a 27 mm diameter, this watch with its quartz movement can also be worn with an additional black satin strap. An exclusive ingenious system of interchangeable straps, the Linea collection lets the wearer change straps in an instant without a tool, adding the right color to any fashionable look. Just in time for the holiday gift giving season, the collection is for the first time offering two models fashioned in 18K red gold. Haloed in light and majesty, the Linea 10090, with some 24 grams of gold, leads the dance with a remarkable amber harmony. Its brown sun-brushed dial with azure glints set with 12 diamonds and its ravishing brown strap will make more than one heart throb at the stroke of midnight! Also fashioned in 18K red gold, the Linea 10091 watch is as delicate as it is spectacular. The bezel set with 22 diamonds (0.18 cts) lights up a white mother-of-pearl dial graced with riveted appliqué indexes and slender gilt hands. The black satin strap adds a final touch of elegance. 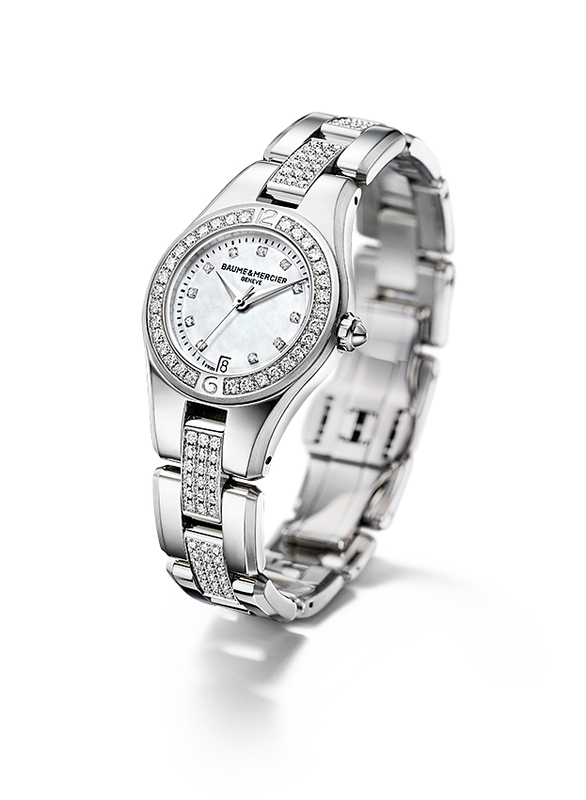 Just like the model 10090, this ultra-refined and feminine watch runs on a quartz movement and comes in a 26 mm size.